At a tranquil island retreat in India, Aniamma Philip—known to all as Mummy—teaches visitors how to make spicy curries and masalas with ingredients from her family farm. Philipkutty’s Farm. For me the odd name evokes a dreamy paradigm of south India—an arch of vermilion bougainvillea blossoms, the sheen of lake waters interrupted by a dugout’s narrow wake and, above all, the blissful silence, broken only by birdsong, the chatter of women washing clothes along the shore and the chants from a Hindu temple across the canal. Such tranquility was what had led me and a group of friends to Philipkutty’s, after three rapid, event-filled weeks traveling in south India. Philipkutty’s occupies a good part of an island in the middle of Vembanad Lake in Kerala, a state on India’s southwest coast. Canals, streams, marshes and flooded rice paddies radiate out from the 80-square-mile lake, and together they make up the intricate brackish system Keralites call the Backwaters. In January, during the dry season, the temperature along the coast still hovers in the upper 80s and the air is heavy with moisture. This extraordinarily fertile area produces everything from commercial crops to a plethora of spices, including black pepper, cinnamon, turmeric and ginger. Philipkutty’s, which grows coconuts, bananas and other tropical fruits, also operates a type of family-run inn called a homestay, in which guests live with the hosts. 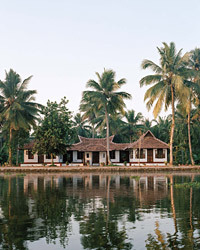 Five lakefront guest villas are built in a traditional Keralan bungalow style, with white stuccoed walls and verandas overhung with dark-red-tiled roofs. There are no phones and no television sets, just a quiet and seemingly effortless elegance. It was the perfect place for us to unwind and absorb all we had experienced. The family and guests dine together three times a day at a big, round table or in an outdoor pavilion, and these home-cooked meals were delicious. My daughter, a chef in New York City, and I were thrilled to discover something more at Philipkutty’s: a fine cook and teacher. Her name is Aniamma Philip, though she’s called Mummy by guests and staff alike, a name befitting her gentle mothering in the kitchen. With her daughter-in-law Anu Mathew, she owns and operates the farm, which in addition to commercial crops also produces ingredients for the homestay’s meals, including spices and eggs. The farm, which is mostly cultivated organically, was established by Mummy’s father-in-law more than half a century ago. In 1999, her son Vinod Mathew started adding the guest bungalows. After Vinod’s unexpected death last year, Mummy and Anu took over. Philipkutty’s is still a working farm, but the focus now is on guests who usually stay several days, a week or even longer. Others might come just for a cooking class and lunch, sometimes making a stop at the farm during a tour of the lake on a kettuvallam, a jackwood boat with a vaulted coconut-fiber roof that was originally used for transporting rice to market. Taking classes with an expert home cook like Mummy is a wonderful way to get inside the culinary culture of a region where restaurant food, for the most part, is unimpressive. Mummy specializes in Syrian Christian dishes such as meen molee, fish cooked in a coconut sauce. (The apostle Thomas brought Christianity to the Malabar Coast in the first century A.D., and a large wave of Syrian Christians arrived in Kerala 300 years later.) But she will also cook traditional Keralan recipes like avials, vegetarian stews served at family celebrations that she makes with cucumber, potatoes and a spicy mix of green chiles, cumin and shredded coconut. Coconut in some form (either oil, milk or the meat—grated, roasted, powdered or chipped) plays a part in nearly every Keralan dish, as do chiles, black pepper, turmeric, shallots, cumin, ginger and curry leaves. Sour flavors often balance the spices—usually yogurt and tamarind, but sometimes lemons and limes along with kokum, a dark dried fruit that’s similar to the mangosteen and has a smoky aroma. Dishes often receive a final garnish of black mustard and fenugreek seeds, or sometimes curry leaves or dried chile peppers. The spices are cooked in hot coconut oil until the seeds pop, then drizzled over the top of a dish. Usually Mummy teaches guests whatever dishes she’s planning to serve that day, but she’ll also honor special requests if she can. Dressed in an immaculate silk sari, Mummy moved gracefully around her tidy, modern kitchen, putting together the ingredients for a spicy masala paste in which to cook fresh shrimp, raised in the paddies of the Backwaters between crops of rice. She laid out her ingredients with smiling assurance, aware that many of them are unknowns to outsiders, like kokum, which she allowed us to smell, and then gave us a broken-off bit to taste. Mummy doesn’t speak much English but she is deft at comprehending what needs to be demonstrated. Anu translates at her side. "In a traditional kitchen," Anu said about the combination of spices in the garam masala, "we’d make this paste with a mortar and pestle, but it goes much faster with a food processor." Soon a marvelous aroma wafted from a cheenachatti, the Kerala cook’s all-purpose woklike pan, as Mummy scattered the curry leaves across a shimmering surface of hot oil. As the leaves started to sizzle, she stirred in onion, garlic and ginger. Then she added the masala paste, which gives off a wonderful, complex smell, and finally shrimp. Mummy also showed us how to make a Keralan duck curry with a velvety coconut sauce fragrant with cardamom and black pepper as well as curry leaves and fresh ginger grown just outside the kitchen door. Thin coconut milk is used for braising the duck, while thick coconut milk is swirled into the sauce just before serving. "But never let the sauce come to a boil," Anu explained, translating for Mummy, "because it will curdle." Occasionally Anu will demonstrate a recipe herself, such as a sweet, simple coconut pudding topped with pineapple and candied cashews. Since Vinod’s death, however, she occupies herself much more with the overall maintenance of Philipkutty’s and making sure that guests are comfortable, bringing them hot tea or ensuring there are fresh flowers in the rooms. She will also arrange quick trips by dugout across the canal to an Ayurvedic clinic offering massages and other traditional cures, or arrange for a car to take guests on a shopping excursion to a neighboring town or to visit one of the small, family-run Hindu temples nearby. One bright morning, Anu took us on an early walk around the farm, encouraging us to sample toddy, a rapidly fermenting, heady liquor made from the sap of the coconut palm. A worker perched high on the slender, arching trunk of the tree made a gash near the top, then caught the oozing sap for us. Anu pointed out kokum, guava and clove trees, vanilla plants, pepper vines, mangoes, bananas and curry-leaf bushes, along with enclosures for the cows, chickens, ducks and geese. The day we left, Anu came down to the dock with her son, nine-year-old Philip, to see us off in the dugout that would carry us across the canal to our waiting taxi. "One last question," I begged her as the boatman pushed off. "What does the name mean?" "Philipkutty’s?" Anu smiled gently. "Philip was Vinod’s father’s name, and his nickname was Philipkutty. It means"—she raised her voice as the boat pulled away—"Little Philip’s Farm." She looked down at her son, then both lifted their hands to wave good-bye across the waters. NOTE Ingredients like tamarind puree and fresh curry leaves are available at specialty Indian markets and by mail order from Kalustyan's (800-352-3451 or kalustyans.com) or Grocery Babu (grocerybabu.com). Nancy Harmon Jenkins is a journalist and the author of six books, including the forthcoming cookbook Cucina del Sole, a celebration of the cuisines of southern Italy.